If you’re looking for a suite that saves a lot of space in your bathroom then the soft gentle lines of the Affine Amelie Bathroom Suite are a perfect match. The modern square look and supreme quality are what make it one of the most popular ranges on the market. The toilet is a short projection model. This means that the pan only projects from the wall by 600mm, which makes it ideal for a bathroom where space is tight. Toilet cistern is equipped with a dual flush push button that saves water. It does this via a split button; one smaller button deals with a lesser flush for liquids, while a larger full flush button tackles the solids. Also includes a luxury soft close seat. No more banging the seat against the pan by mistake! 6/3 litre duel economy flush system. The wide squared basin provides ample washing space, along with a full pedestal to complete a stunning designer look. Has the look of an expensive designer suite, but at an ideal affordable price. All cistern fittings are included in the purchase. The water inlet is on the bottom left-hand side of the toilet cistern. One tap hole basin, which will fit any standard mono basin mixer tap. Depth: 415mm (16 ¼ in). Width: 550mm (21 ¾ in). Here at plumbworld we love this product! Not only is it practical, space-saving and affordable, it is brilliantly stylish. 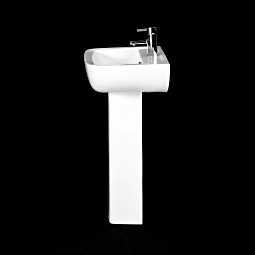 Smooth gentle lines paired with minimalist design give this basin a sophisticated and luxurious feel. We love!! Bought this set as a replacement in the en-suit and it is absolutely cracking. Even the plumber how fitted it was really impressed with the quality and asked where I bought it from. Very impressed.